Big m84, thanks for the reply, wow thats good to hear, hope it continues to go well for you! Hello, I am a basically a month into 20mg a day, still getting the occasional big spot. Main concern is post acne red marks. How do I get these to fade?! 20MG Accutane Every Day, ADVICE?! Day 27 Its not looking good at the moment. Pimple beneath my ear is still red and I am developing a big red spot on my cheek. It looks so visible. Derm refused to bump me up to a higher dose and doesn't want to do so until December 1st :(. Currently have 3 or 4 actives but my PIH is a mess and seems to get redder each day if anything. Please can someone give me advice on how to fade these red marks !!! Day 20 Big pimple beneath my right ear is still just as big, I think I have made it redder as well by over treating it, but it won't go! Skins looking ok at the moment, went out last night to a mates birthday and got really drunk so I am nervous about that causing more spots :(((. Lips are getting a bit drier, anyway I see my dermatologist in two days so will post on here what happens! Day 9 Don't really think I have experienced any of the side effects apart from maybe a bit of aching. Currently have big spot under my chin still, which won't go! Spot in between my eyebrows and one on my left eyebrow both of which are painful! Post acne red marks seem to get redder everyday. How do I get these to go! Any advice would be much appreciated/ experience with roaccutane. 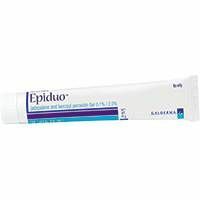 I have been on Epiduo for 16 weeks today and doxycycline 100mg a day. I currently have 5 pustules on my face + tonnes of PIH, does this mean I need to change treatment? Hello, Need help creating a routine for epiduo, at the moment I am moisturising when I wake up and of an evening cleansing with cetaphil gentle skin cleanser, waiting 10 minutes, putting pea size amount on both cheeks and chin, then waiting 20 minutes and moisturising with cetaphil moisturising lotion. Is this correct? Hi, thank you, any recommendations on which moisturisers?